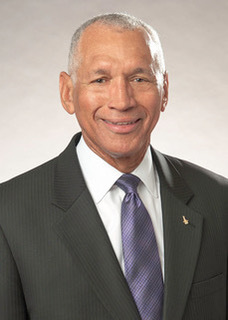 Charlie Bolden was nominated by President Barack Obama and confirmed by the U.S. Senate as the 12th Administrator of the National Aeronautics and Space Administration (NASA). He began his duties as head of the Agency on July 17, 2009 and retired from NASA on January 20, 2017. At NASA, Charlie oversaw the safe transition from 30 years of Space Shuttle missions to a new era of exploration focused on full utilization of the International Space Station and space and aeronautics technology development. The Agency’s dynamic science activities under Charlie include an unprecedented landing on Mars with the Curiosity rover, launch of a spacecraft to Jupiter and continued progress toward the 2018 launch of the James Webb Space Telescope (JWST), the successor to the Hubble Space Telescope. Born August 19, 1946, in Columbia, SC, Charlie graduated from C. A. Johnson High School in 1964 and received an appointment to the U.S. Naval Academy. He earned a Bachelor of Science degree in electrical science in 1968 and was commissioned as a second lieutenant in the Marine Corps. In 1977, he earned a Master of Science degree in systems management from the University of Southern California. Charlie also had a long and distinguished military career. He flew over 100 combat missions during the Vietnam War. He later served as a test pilot for the Naval Air Test Center’s Systems Engineering and Strike Aircraft Test Directorates. After completing his service as an astronaut in 1994, he served as the Assistant Commandant of Midshipmen at the Naval Academy and in 1998 as the Commanding General of the Marine expeditionary force attached to Operation Desert Thunder in Kuwait. He last served as Commanding General of the 3rd Marine Aircraft Wing at Marine Corps Air Station Miramar, California, prior to his retirement from the Marine Corps. Charlie's 34-year career with the Marine Corps included 14 years as a member of NASA’s Astronaut Office. After joining the office in 1980, he traveled to orbit four times aboard the Space Shuttle between 1986 and 1994, commanding two of the missions and piloting two others. He retired from the Marine Corps in 2003. Charlie's past honors include the Defense Distinguished Service Medal, the Defense Superior Service Medal, the Distinguished Flying Cross, Air Medal, three NASA Exceptional Service Medals and four NASA Space Flight Medals. He received the National Space Trophy in 2014 and holds several Honorary Doctorate degrees from numerous institutions of higher education. He was inducted into the U.S. Astronaut Hall of Fame in May 2006 and enshrined into the National Aviation Hall of Fame in October 2017. Today, Charlie serves the President and CEO of The Bolden Consulting Group LLC. He serves as an independent Director of the LORD Corporation and Atlas Air Worldwide Holdings. He also serves as a pro-bono Director of the Marine Corps Scholarship Foundation, the Naval Academy Foundation and the Alliance for Peacebuilding. He is a Regent of the Potomac Institute and a Trustee of the Bankinteer Innovation Foundation. Charlie is married to the former Alexis (Jackie) Walker of Columbia, SC. The couple has two children—Anthony Ché, a colonel in the Marine Corps, who is married to the former Penelope McDougal of Sydney, Australia; and Kelly Michelle, a plastic surgeon at the Howard University Hospital in Washington, DC. The couple has three granddaughters: Mikaley, Kyra, and Talia.